March 3 was our third Annual Doll Festival. I had a great time! The largest crowd I counted was 29. So we got good attendence. But, we will probably try celebrating Doll Day on Saturday next year. There are so many people to thank. I want to start with Mei, because she had to work hard being our hostess for the dances. KT built, Andi supervised, Bubbles was our DJ for both dances. Aubry coordinated for us. 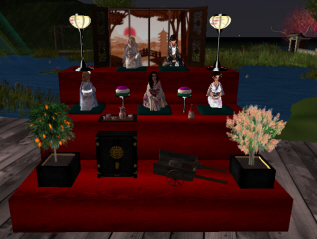 Annelies reconstructed her HinaMatsuri stand. AITech and RagDollz helped with door prizes. Saki let us use our land. There was no lag I could see. The festival landmark still leads to her Cure Maid Cafe. We are dolls at Second Life. In return for winding our keys and giving us life, anyone may dress us, pose us, and carry us. Most dolls are friendly and nice and appreciate having their key used. Community Dolls is also a wider community of dolls, winders, dollmakers, and anyone who supports this idea. The key is a way for us to be dolls without having an owner. (It is also owner-friendly). It shapes us into dolls and helps other people treat us like dolls. Our home is at Pasha's, and you can get a free key there. Okay, just to be clear. We are NOT pieces of plastic. Um, some dolls want that, but it isn't very healthy or practical. We try to be full of life. Also, we have a really strong need to please and be liked, but only some of us are pleasure dolls.